In the sequel to Whistling in the Dark, Red Skelton again plays the role of Wally Benton, The Fox  – a radio detective, who simply wants to take off two weeks of vacation so he can get married to his long-suffering fiancee Carol Lambert (played by Ann Rutherford). Wally pretends to be on the verge of a nervous breakdown in order to twist his radio sponsor’s arm in order to get that vacation, only to have Carol change their plans when she’s contacted by Ellamae (Diana Lewis), her sorority sister from Georgia, U.S.A., whose boyfriend appears to have been murdered. Carol convinces Wally to go down to Georgia to get married, and Wally complies, only to get involved in the unraveling mystery. Once down South, Wally and Carol register to get married (in a nod to Red’s movie, The Fuller Brush Man, Red is traveling incognito as “Mr. Fuller”), where the local clerk, Mr. Panky, soon divulges his identity to the District Attorney and the Sheriff – “You dragged it out of me!” However, not everything is as it appears … Another seeming source of danger is Chester, a former convict paroled into the custody of Judge Lee, Ellamae’s uncle. 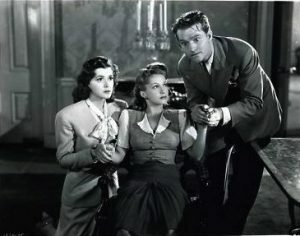 Chester, played by Rags Ragland, is the twin brother of Sylvester, one of the Silver Haven villains from the first movie, Whistling in the Dark. This initially leads to a funny case of mistaken identity as Wally attacks Chester while he’s driving the car and later to a more dangerous time as Sylvester escapes from prison, and arrives on the scene. The mystery soon turns into a hunt for lost treasure and has numerous funny moments, plot twists, and dangerous moments (such as trying to escape from a sealed room before they drown). The ending is one of the best, funniest climaxes that I’ve seen in a movie; the confusion between Chester and Sylvester is laugh-out-loud funny. It’s a very good movie, which I rate 4 clowns out of 5. Wally “The Fox” Benton (Red Skelton): (as Carol is opening a very small box) I’ll bet I know what it is — one of those new bathing suits the girls are almost wearing this season. Wally “The Fox” Benton (Red Skelton): What I always wanted – a Japanese beetle. Carol Lambert (Ann Rutherford): What makes you think it’s a Japanese beetle? Wally The Fox  Benton (Red Skelton): Its got a yellow belly. Bellboy: Did you tip her off? Wally “The Fox” Benton (Red Skelton): Yeah, tip. Well, here my good man, here’s a brand new American dollar for you. Bellboy: That’s only a nickel. Wally “The Fox” Benton (Red Skelton): That is the new American dollar after the income tax has been removed. Chester Conway (Rags Ragland): I just heard my brother Sylvester got sent up with the Silver Haven mob. He got 13 years. Judge Lee (George Kibbee): 13 years? That’s bad luck, ain’t it? Ellamae Downs (Diana Lewis): You can call me Ellie. Wally The Fox  Benton (Red Skelton): If I call you, it’ll be collect. Wally “The Fox” Benton (Red Skelton): So you admit your name’s Sylvester! Chester Conway (Rags Ragland): I don’t admit it, I just answer to it. Wally The Fox  Benton (Red Skelton): I don’t get it. Chester Conway (Rags Ragland): Well, look. Originally, I was Sylvester, and Sylvester was Chester. In the hospital they got mixed up, Chester became Sylvester, and I became Chester. People still call Sylvester Chester and me Sylvester. So to save trouble I answer to the name Sylvester and Sylvester answers to the name of Chester. Understand? Wally “The Fox” Benton (Red Skelton): Oh, you’re twins. Wally “The Fox” Benton (Red Skelton): Now don’t start that again! Chester Conway (Rags Ragland): Mr. Fuller, if it’ll make it any easier, why don’t you forget Chester and Sylvester and call me by my nickname. Wally “The Fox” Benton (Red Skelton): What’s that? Chester Conway (Rags Ragland): Lester. Wally “The Fox” Benton (Red Skelton): I bet you got a sister named Esther. Chester Conway (Rags Ragland): No, but I got another brother. Wally “The Fox” Benton (Red Skelton): What’s his name? Chester Conway (Rags Ragland): Smitty. Mr. Panky: Getting married, eh? Wally “The Fox” Benton (Red Skelton): Yeah. Mr. Panky: Well, well, we can’t be happy forever, you know. Wally “The Fox” Benton (Red Skelton): You got a hankie, Panky? Sheriff Claude Stagg (George Bancroft): You must come up and have a Mint Julip with me sometime. Wally “The Fox” Benton (Red Skelton): Yeah, we can get Southern fried. Carol Lambert (Ann Rutherford): Don’t be such a coward! Wally “The Fox” Benton (Red Skelton): Who’s a coward? I’m as brave as they go, and I’m going. Ellamae Downs (Diana Lewis): What do you think a ghost would say if he saw us coming down the stairs? 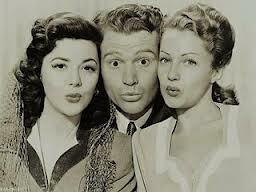 Wally “The Fox” Benton (Red Skelton): He’d say, “Hello girls,” because I’d be gone! Wally “The Fox” Benton (Red Skelton): Come out of there! Are you going to come out of there, or am I gonna have to run for my life? Carol Lambert (Ann Rutherford): I don’t think it’s safe down here. Someone was trying to kill us! Ellamae Downs (Diana Lewis): It’s things like this that ruin our Southern hospitality. Wally “The Fox” Benton (Red Skelton): I think I dood it! Wally “The Fox” Benton (Red Skelton): For two cents, I’d punch you in the nose. Sheriff Claude Stagg (George Bancroft): Why don’t you do it? Wally The Fox  Benton (Red Skelton): Well, money isn’t everything. Wally “The Fox” Benton (Red Skelton): It’s rather warm in here, we should open a window. Carol Lambert (Ann Rutherford): We’re three levels underground, there are no windows! Wally “The Fox” Benton (Red Skelton): Then don’t open one! Wally “The Fox” Benton (Red Skelton): Hey Chester, did you ever escape from prison? Chester Conway (Rags Ragland): Yeah, 2 different ways. Wally “The Fox” Benton (Red Skelton): How? Chester Conway (Rags Ragland): Well, once I swapped places with a stiff that was fried. Wally “The Fox” Benton (Red Skelton): And the second time? Chester Conway (Rags Ragland): I swapped places with a geek that was hung. Wally “The Fox” Benton (Red Skelton): What are you, a one-idea man? Couldn’t you think of anything but corpses? Chester Conway (Rags Ragland): Don’t never fail, corpses always get out. Carol Lambert (Ann Rutherford): Well, we’re all liable to be corpses pretty soon. Chester Conway (Rags Ragland): Then we got nothing to worry about! Wally “The Fox” Benton (Red Skelton): What are you, a moron? Chester Conway (Rags Ragland): Yeah, and we’re organized, too! Wally “The Fox” Benton (Red Skelton): [about the unconscious Sheriff in the rising water] He’s got one foot in heaven and one in a Turkish bath. Wally “The Fox” Benton (Red Skelton): Say, what kind of town is this anyway? Carol Lambert (Ann Rutherford): Why, look! There are two buzzards making a nest out of hay. Wally “The Fox” Benton (Red Skelton): [Paranoid] Oh, no, they’re not. They’re probably drawing straws to see who gets me! Wally “The Fox” Benton (Red Skelton): Had his neck in the noose, and pulled it out. Chester Conway (Rags Ragland): That reminds me of my Uncle Steve! Only he didn’t pull it out. Frank V. Bailie: [threatening Wally with a gun] Git back agin that wall! Wally “The Fox” Benton (Red Skelton): [cowardly] Thanks. I need something to hold me up. Sheriff Claude Stagg: [Amid rising water] Someone help me up! I don’t want to drown like a rat! Wally “The Fox” Benton (Red Skelton): Well, you oughta know how! Carol Lambert (Ann Rutherford): [Panicked] Oh, I hope I wake up in the morning and find it’s all a dream! Wally “The Fox” Benton (Red Skelton): I hope I wake up! Wally “The Fox” Benton (Red Skelton): [after failing to walk through a wall] Pardon me. I thought I was Mr. Jordan!